AbercrombieAbercrombie’s new store in Columbus. Abercrombie is shrinking the size of its stores. On Friday, in a call with investors, the company’s management team outlined plans to roll out 70 smaller store locations in 2018. In 2017, the Abercrombie brand opened seven smaller prototype stores. CEO Fran Horowitz claims these stores are generating more sales per square foot in a smaller footprint. Abercrombie is shrinking the size of stores to boost sales. In a call with investors on Friday, Abercrombie and Fitch’s CEO, Fran Horowitz, outlined the retailer’s plans to roll out 70 smaller stores in 2018 – 12 of which will be for the Abercrombie brand, 7 Abercrombie Kids, and 50 Hollister. “We are evolving as the retail pattern is evolving” Joanne Crevoiserat, chief operating officer at Abercrombie & Fitch, said on a call with Business Insider after it reported earnings. The company has made a significant investment in its stores over the past year. In 2017, it created seven new Abercrombie prototype stores, downsized 16 of its stores, and closed 39. Earlier this year, it said it would close another 60 stores in 2018. The new, smaller locations, however, are proving to be effective for the brand. “We don’t need that level of space,” Horowitz said, referring to the former larger stores. “The new stores are more shoppable – we’ve turned on lights and made it easier to shop for product and house product,” she added. 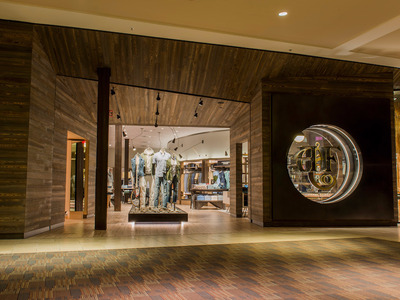 Abercrombie is wising up to the fact that ‘less is more’ when it comes to the store experience, following in the footsteps of trendy start-ups such as Everlane, which have innovated the way we shop by offering a minimalist shopping experience. Everlane is certainly more extreme, however. Abercrombie’s teen sister brand Hollister has been leading the way – almost 50% of its stores have been remodeled, helping to drive more sales, Horowitz told Business Insider. The turnaround effort for the brand seems to be working. On Friday, Abercrombie & Fitch announced its second quarter of consecutive growth – same-store sales at the Abercrombie brand itself were up 3%, and 5% overall, thanks to strong sales at Hollister.